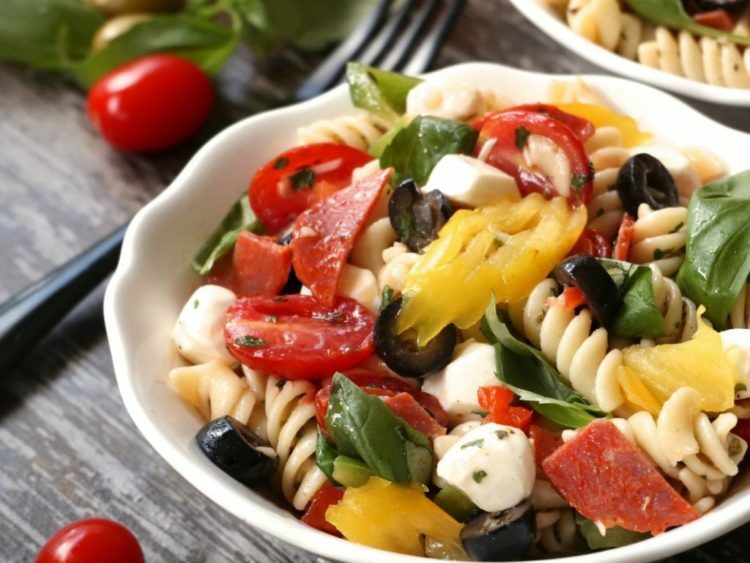 "An impressive Italian Pasta Salad with a homemade Italian dressing and loaded with fresh basil, pearl mozzerella, pepperoni, banana peppers and more! 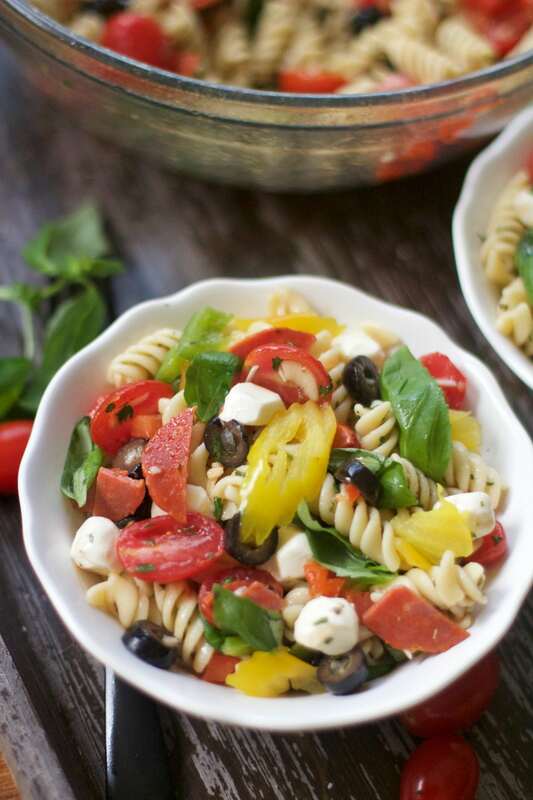 An easy pasta salad recipe that's light, elegant and casual!" Visual learner? Watch me make this Italian Pasta Salad from start to finish! I’m blessed to have grown up in a pretty diverse Southern city. My neighborhood consisted of a melting pot of different ethnic & religious groups, gays & lesbians. The church I attended was no different. Although it had a particular denomination, I think anybody could join no matter your lifestyle, beliefs, etc. The people were lovely. But all that diversity made for some very entertaining moments. I could seriously write a comedy series on all the different “characters” in that place. Today, we’re going to talk about Miss Mary for a second. Miss Mary was a fiery, Catholic Italian grandmother with a thick New York accent. You never knew if she was gonna cuss you out (yes in church) or say “Come here dawlin give me a hug. You’re so thin are you eating?”. You also never knew if she was really angry or just talking loud and passionately. She had this younger guy named Paul that helped her out a lot. She would cuss poor Paul out as if cussing had points. Like seriously yall, I never knew you could string all the cuss words into one sentence until I met Miss Mary. She is the real MVP in my book! For the most part, Paul would bare her brutal insults out of respect, but once in a blue moon, he would snap and let her have it in his own heavy New York accent. Every day after church we had lunch. Miss Mary would always bring the most delicious looking authentic Italian pasta salad. The bold fragrance of garlic, basil and onions would fill the room and people would rave about how fresh it tasted. I never got the try Miss Mary’s Italian Pasta Salad. Oh well, from that point on I was left to admire the beauty of that Italian pasta salad. Man, was it torture to my greedy, foodie-kid soul seeing all that fresh basil, pearl mozzarella, pepperoni, peppers, and olives and not being able to touch it. Cause your girl, don’t do that shared eating business. At. All. Nowadays, I make my version of that gorgeous Italian pasta salad that looks just like Miss Mary’s. I’m not sure if it tastes the same, but my oh my is it GUUUUUUUUD! It has a sense of elegance about it and would be great for a bridal shower or wedding. One guy said, “This is pasta salad for adults!” Ha! I’d have to agree, although my little Ethan loves it!! What I adore about this Italian pasta salad is that you can taste ALL of the ingredients. The homemade Italian dressing is bold, yet it doesn’t overtake everything like the store-bought versions tend to do. You can seriously taste the sweetness of the tomatoes, the tartness of the olives and banana peppers, the coolness the pearl mozzarella, the spiciness of the pepperoni, the savoriness of the fresh basil..mercy. 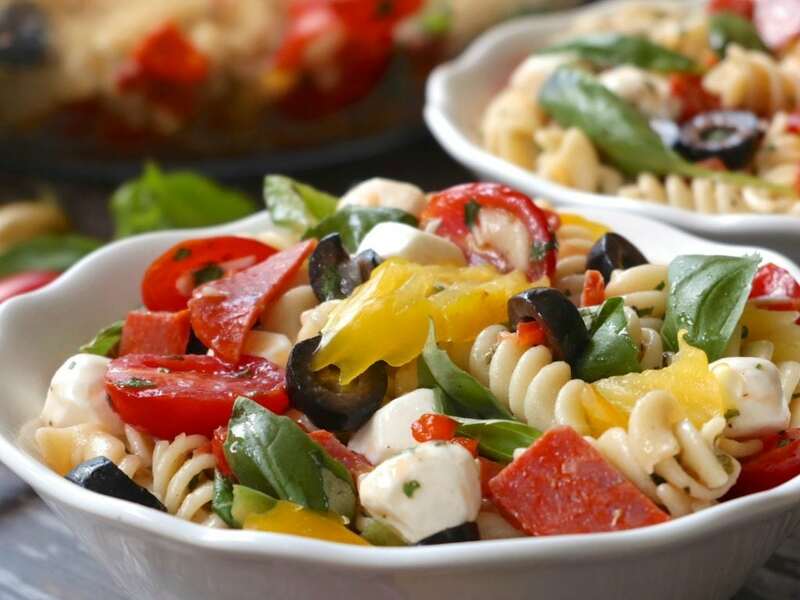 To have so many bold players, it’s a surprisingly light-tasting pasta salad! Everything gets along so well. Make it. You deserve it. Combine all of the dressing ingredients in a glass jar. Shake well to incorporate the ingredients. Store in fridge until ready to use. To prepare the pasta, place the cooked and cooled rotini pasta in a large bowl. Stir in tomatoes, black olive, pepperoni, banana peppers, red bell peppers, & green bell peppers in a large bowl. Stir in basil and mozzarella. Add parsley for more color if desired. I cook my pasta until al dente and then immediately rinse with cool water. Feel free to up the amount or decrease the amount of any pasta salad add-ins!